Scoring 21 goals in your first four international games is one way to turn heads on the court. The skills of Junior Kurukuru’s prolific rising star Raphael Le’ai have certainly caught the eye at the OFC Youth Futsal Tournament at the Bruce Pulman Arena in Auckland this week. After the first two days, Le’ai was already 11 goals ahead of his next rival for the golden boot award – Vanuatu’s Jayson Bule – and his tender age of 14 only underlines his ability. He opened with seven goals against American Samoa, before putting four past the hosts. Le’ai netted all three goals in a tight win over New Caledonia on day two then added another six against Samoa. 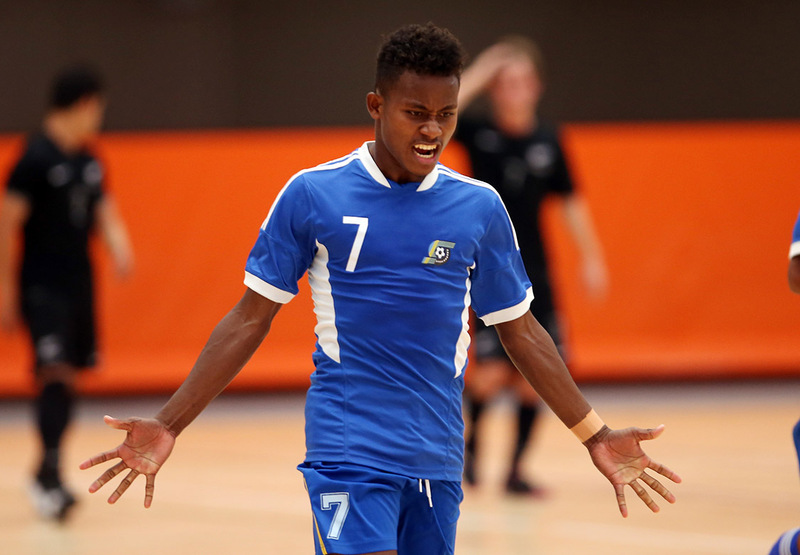 The attacking focal point for a talented and well-drilled Junior Kurukuru has done his part to help his side win the inaugural OFC Youth Futsal Championship and qualify for the 2018 Youth Olympic Games in Buenos Aires and he added another 5 against Vanuatu this morning to bring his total to 26 and edge the Solomon Islands to the brink of achieving that target. Speaking after the second match day on Thursday, Le’ai referenced the squad’s build-up which included a tour to Australia in addressing why he and his teammates were in such good form. Solomon Islands coach Stanley Puairana says there a number of traits that Le’ai brings to the court. Hailing from Malaita, Le’ai only took up the sport five years ago when a coach told him he should. Le’ai played for Koloale in this year’s Bulk Shop U-16 Futsal League but says this week’s event is a step up. With plenty of senior Kurukuru players to look to for inspiration, Le’ai singles out Solomon Islands talismanic skipper Elliot Ragomo as his role model. Ragomo recently broke historic ground signing for Minas Clube in Brazil’s Liga Nacional de Futsal and Le’ai would love to follow in his footsteps.